This super striking CV template is ideal for roles such as Care Assistant, Support Worker, Healthcare Assistant, Nursing Assistant, Community Care Worker, Registered Nurse or Auxiliary Nurse. It features an eye-catching 'care' themed motif which surrounds your name and professional title at the top of the page - together with a vertical contact details section to add interest. All the other sections you'd expect to find are here, with attractive bullet points for both skills and interests. You can easily expand this CV template to meet your needs, or remove sections without any hassle. Free CV Template for a Care Assistant or Nursing-type role (MS Word format)	Overall rating:	4.6	out of 5 based on 3	reviews. Make a great first impression with this very striking CV that is perfect for care-related roles. Easy to use and customise, it's the perfect template for a care role. Make sure you install the OPEN SANS font suite from Google, before editing your template. On average an employer would receive between 30-50 applications for just the one job posting, so getting to the interview stage can be extremely tough. Your extensive work experience, fantastic skills and perfect qualifications won’t get you to the interview stage if you don’t present your information in the best possible light, and with so many other CVs to look at the hiring manager will make the natural choice to choose a CV that ticks all the boxes. To help you get a call back for that all important interview, here are 3 simple ways you can make your CV stand out from the rest of your competition. One of the biggest mistakes a huge majority of applications make is that they don’t fully consider the employer and what they’ve requested in the job advert. It’s easy to assume that if you simply list all of your skills and qualifications that the employer will take notice, but there is much more to writing a great CV if you take more care. Check over the job advert to see which specific set of skills they’ve requested; which qualifications, and what type of experience they are looking for. That way, you are better able to tailor your CV to the role and the company to ensure they don’t miss what you have to offer. Even if you’re applying to lots of different companies, you should always tailor your CV to match each role. It doesn’t matter if the roles are similar or even have the exact same job title, as each employer will still create different job adverts and have varying cultures. Take special note of the keywords and the industry jargon that’s being used. It will pay dividends to match certain keywords and phrases and make your CV industry specific, to allow the employer to place more confidence in not just your abilities, but also your industry knowledge and expertise. One of the biggest issues the hiring manager faces and one of the most frustrating is finding spelling and grammatical errors. In today’s competitive job market, just the one single spelling error could massively decrease your chances of getting an interview. There are just no excuses for even just the smallest error when there are so many ways to ensure your CV is completely free of errors. After checking your CV a million times over, it’s still a good idea to have it proofread by someone else to be completely sure there are no mistakes. The great thing about this is that you can also ask them to read through your CV to see what they think. If you can, try to contact someone who is or has been a manager and has experience with reading CVs and conducting interviews. Many years ago before the internet took off you would have to create your own CV template. This would typically result in just opening up Word and creating a few headers to write your information underneath. If you still do this and have the same CV template that you’ve been using for years, you need to start from scratch using a fresh, modern CV template. 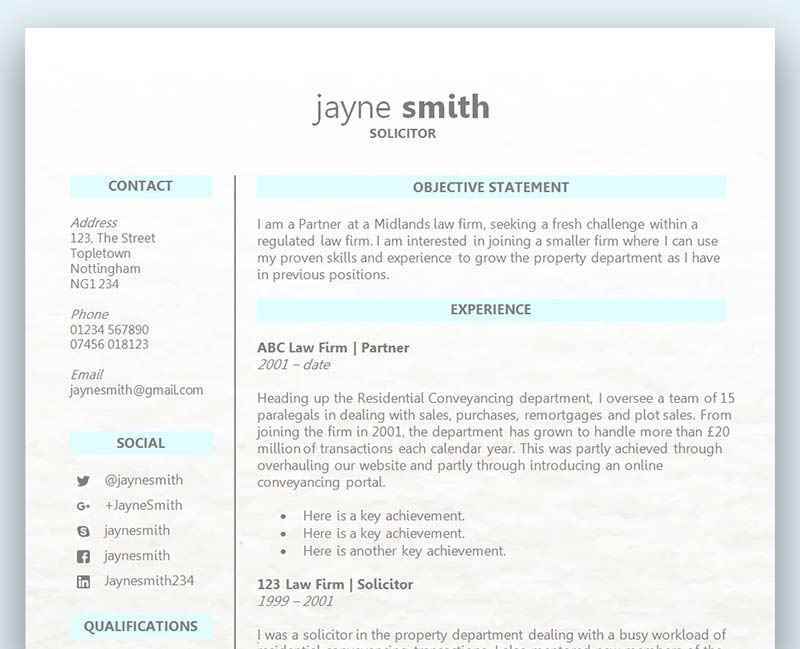 There are so many advantages to using a CV template that it wouldn’t make sense not too. Not only will it make your CV look amazing, you will also save a huge amount of time allowing you to focus everything into the content of your application. Many CV templates are also designed with a specific job or industry in mind, which makes them even more presentable to a prospective employer.